Here’s a sobering statistic- in 2013, 71% of large companies were spending more than $1 million on construction litigation. That was up from 51% from the year before. And according to Arcadis research, it’s only gone up since then. These disputes have increased in overall average value, and duration, which makes them more costly for everyone involved. It’s gotten to the point where if you are in construction, it is a matter of when, not if, you find yourself in a legal battle over work you’ve done. The same research group did construction firms a favor, though. They detailed not only how many construction disputes there were that ended up in legal negotiations, but they went so far as to name what the main causes of those disputes were. Coming in at #1 was “failure to administer the contract.” Put quite simply, that means there is some dispute over whether or not work was completed at all, and whether that work was done in a manner that was satisfactory to the client. The best way to avoid litigation? According to Arcadis, “accurate contract documents.” That means daily reports that are thorough, accurate, and filed correctly. The problem with that solution is that it is often difficult for superintendents, foremen, and PMs to get the documents they need at the end of the day. Supers and subs are busy completing their work, and filling out a daily on pen and paper or sitting in front of an excel spreadsheet at the end of the day just isn’t feasible anymore. More often than not, daily reporting is pushed to the backlog where supers and PMs work for a month or more completing dailies from the lifespan of the project. Unfortunately, even when that paperwork is done, it’s incomplete and won’t hold up in a court case. Sloppy dailies won’t hold up because they lack the properly documented photographs, information, and time-stamps of reports completed that day. And that is assuming that they are in an electronic method of some kind- pen and paper systems are even worse, and are notorious for losing valuable dailies that could protect you against future action. No, the best way to avoid litigation is to collect accurate, thorough dailies every day, and to make sure that those dailies contain these basic elements. Collated- this essentially means stored, organized, and easily searchable so you can find that one daily your lawyer will need in a hurry. While doing this on pen and paper or in an outdated software system can be a nightmare, cloud-based reporting software is by far the easiest option. It stores your documents indefinitely, and is accessible through multiple devices and tools that can call up the documents when you need them. Delay documents- one of the most common reasons behind delays, and thus failing to administer the contract on time, comes from the weather. Your daily reports need to capture the weather conditions that day. These conditions can then quickly be verified and you have proved, legally, that your delay was justified. Worksite conditions- another common reason for failing to deliver contracts is the communication and coordination of different teams and subcontractors. If a portion of the site could not be worked on because a sub had not done their portion of the work yet, that needs to be documented. Most of these documents come in the form of the site survey: a list of yes or no questions (with the option to include more details) on site conditions like safety, accessibility, and equipment. The more you gather this sort of information in the moment, the better off you will be in court. Notifications- delays happen, that is the nature of the construction business. However, that doesn’t mean you automatically fail to administer the contract. If delays are sufficiently communicated and more time is negotiated as a result, you can avoid the courtroom altogether. As such, make sure that your daily reporting tool has the ability to immediately (automatically is even better) communicate delays, with details, to project stakeholders. Even if your firm doesn’t get more time, you can prove that you were open and honest in your communications about possible delays, which will only help you when the time comes. Photo management- Pictures are invaluable in a courtroom setting. They prove, beyond a shadow of a doubt, exactly what the condition of the work was that you reported in your daily. However, not just any photograph will do. These photos need to be properly managed with timestamps and location information to prove that they were taken when and where you said they were. So make sure that your daily reporting solution has an adequate photo management component and use it often. Raken checks off all the requirements above, and does it in half the time that end-to-end solutions do. That’s because Raken was designed to be used in the field. Our daily reporting solution guides your Supers and Foremen through a thorough, branded, professional daily report in minutes as they walk the site throughout the day, encouraging them through the easy interface to document everything they see and submit the daily at the end of the day with a single tap. 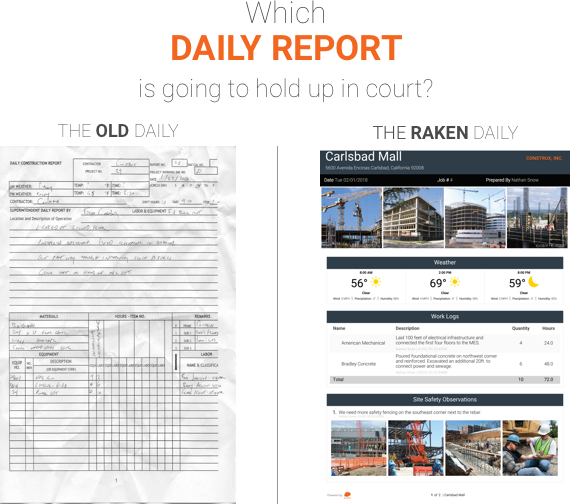 Once submitted, Raken daily reports are collated and kept indefinitely so you can have peace of mind when litigation comes. And Raken integrates with broader construction management solutions like Procore and Egnyte so you can digitize and automate your planning and reporting. Doing so will ensure that your firm is thoroughly protected against any litigation that may come against you.